Microsoft recently (June 13, 2016) announced it would be acquiring LinkedIn, the popular professional social network. New MetaFacts research confirms that LinkedIn’s active members are indeed an attractive demographic, and yet there are headwinds ahead for Microsoft. Our recent Technology User Profile survey of over 10,000 respondents span the US, UK, France, Brazil, and China. Active LinkedIn members stand head and shoulders above the average connected adult professional. In the US, they are 1.4 more likely than average to be employed full-time, and 1.6 times more likely than average to be a college graduate. They are also unique in their employment role, being 1.5 times as likely to be working in Marketing/Communications or in IT/IS, 1.4 times as likely to be a Specialist (e.g., design, engineering), 1.3 times a likely to be a contractor or IT Consultant, and 1.2 as likely to be an Executive or in an HR-related role. A similar pattern holds for the UK, France, Brazil, and China. Microsoft’s ready access to this important population spells many opportunities for Microsoft, if managed well. With a service relying heavily on user-provided content, and with its members showing a high degree of sophistication, education, and strength, member trust and satisfaction will be especially vital to LinkedIn’s future. To the extent Microsoft’s strategy involves increased advertising to LinkedIn members, it faces an existing and growing challenge. LinkedIn members are some of the world’s most advertising-averse. 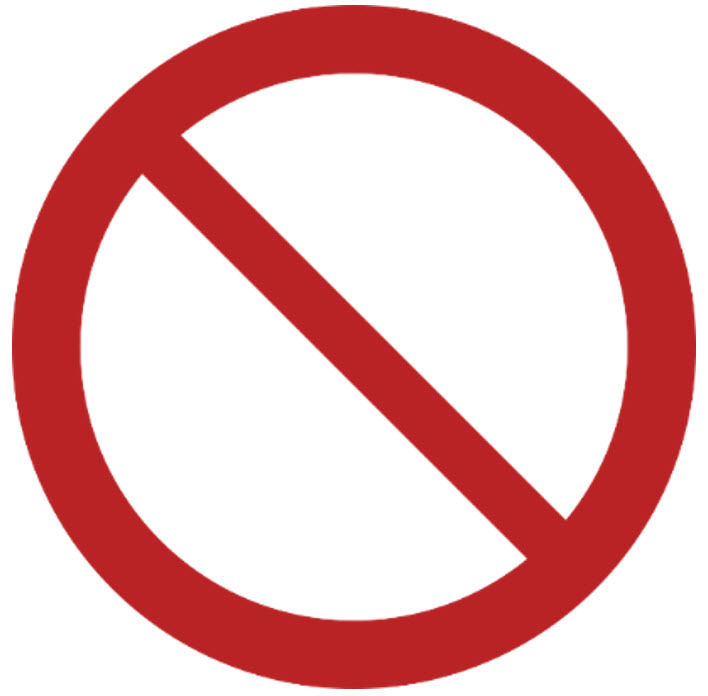 Forty-three percent of active US LinkedIn members use an Ad Blocker on at least one of their connected devices – PCs, Tablets, Smartphones – and in many cases have Ad Blockers on all of them. That is 1.3 times higher than the rate among the average connected adult. This is similar around the world – ranging from 1.1 to 1.5 times higher than average among active LinkedIn members in the UK, France, Brazil, and China. Microsoft will need to continue to maintain the trust that active LinkedIn members have come to rely on. It’s possible they will whitelist ads on LinkedIn. It’s not as if LinkedIn has been specifically targeted by its members, it’s simply that its members are well above average in the practice of blocking ads across their devices. Adblocking has already been a significant challenge for media giants from the New York Times to the Wall Street Journal as technology users increasingly take control over their experiences. If part of Microsoft’s strategy is to encourage LinkedIn’s active members into (or back into) the Windows ecosystem, then it has a trend to reverse. LinkedIn’s active members are well-endeared and engaged with Apple’s devices and ecosystem. In the US, they are 1.8 times as likely as the average connected adult to be using four Apple OS devices, 1.5 times as likely to be using three, and 1.3 times as likely to be using two. Furthermore, LinkedIn’s members are 1.6 times as likely to be using an Apple mobile PC, 1.4 times as likely to be using an iPad, and 1.3 times as likely to be using an iPhone. This similar pattern holds true in the UK, France, Brazil, and China. There’s another climb ahead for Microsoft – LinkedIn’s active members are already well on board with many of Microsoft’s types of professionally-oriented offerings, whether from Microsoft or competitors. So, growth ahead will be incremental, and less about mass introduction into new ways of working. With respect to these key workforce activities, this acquisition might be seen as a defensive retrenchment to hold off further encroachment by the likes of Google. 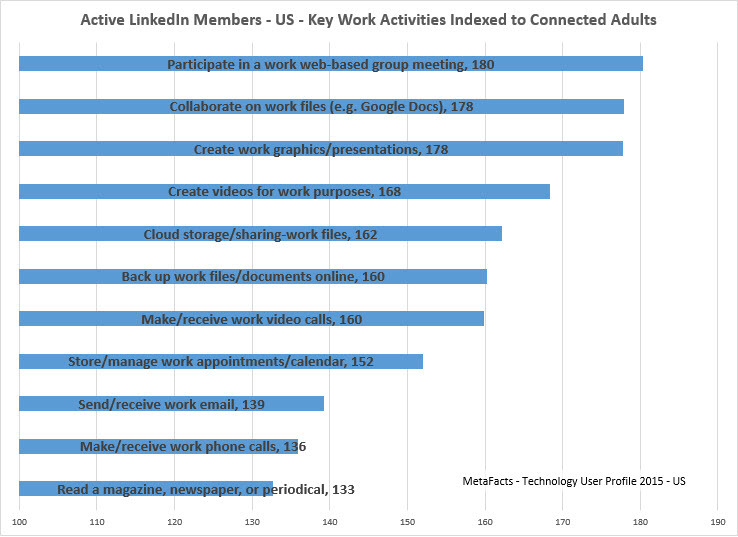 At present, LinkedIn’s active US members are 1.8 times as likely as the average connected adult to already be using one of their connected devices to participate in a web-based group meeting, collaborate on work files, or create work graphics/presentations. Microsoft faces other risks. Imagine how a Google, Apple, or other leading-tech HR executive might consider Microsoft’s unprecedented access to their employees and projects. Any of Microsoft’s direct competitors are likely to have concerns about the depth and details Microsoft will have access to with the richness already in LinkedIn. Although Microsoft will undoubtedly take steps to reassure companies that their data is being held secure and not used directly for its own gain, trust will be a key concern for competitors. Some will likely step up their policies to prohibit or discourage user participation on LinkedIn. At MetaFacts, where we directly measure active market demand, we contend that people matter first. If the members of LinkedIn feel their trust might be compromised, they may flee. Worldwide, there isn’t a single professional social network anywhere near the size or scope of LinkedIn. Rival xing has solid footing in German-speaking countries, while Viadeo is especially strong in France. Potentially, country-specific or language-specific competitors could grow, offering an independent haven for professional social networking. Instead of switching, members may trim their profiles, limit their participation, or simply cancel and close their profile. Microsoft will need to reactivate the membership. In disclosures shared in the acquisition announcements, LinkedIn shared that of their reported 433 million members, 104 million were active within the prior month. This means less than one-fourth (24%) of its members are currently active. This low activity rate is the lowest of nine major US sites: Facebook, YouTube, WhatsApp, Instagram, Twitter, Google+, Snapchat, and Pinterest. Also, membership growth has increased faster than the share of members which are active, further highlighting the decline in member activity. Microsoft’s resources and support may help reverse those trends. This TUPdate includes a complimentary brief summary from the Technology User Profile survey of adults throughout the US, UK, France, Brazil, and China. The results are based on a multi-country survey of over 10,000 representative respondents conducted by MetaFacts. Current TUP subscribers can obtain additional analysis and supporting datasets at a substantial discount. Technology companies who want to know more about their current or future customers can contact MetaFacts to learn how to subscribe to the rich resources of Technology User Profile. Extensive research information about social networking is available in TUP – Technology User Profile. Social networking, like other forms of communication and community, is what makes technology usage expand. People will always be on the lookout for new ways to communicate, whether it be with friends, strangers, or prospective colleagues. The popularity of social networking sites can make ordinary phones and email less interesting to the modern consumer, increasing demand for smarter smartphones and faster Internet connections. At the same time, privacy concerns, information overload, and innocent and criminal abuses can dampen the enthusiasm or participation for some market segments. Below are a few examples of questions addressed in TUP related to social networking. The full TUP service enables drilling down beyond the answers to these questions to identify which other technologies, services and behaviors are disruptive and to profile which market segments are and aren’t adopting. TUP is much more than a one-dimensional market view or opinion piece; it’s a resource that can answer these and other key questions. Which market segments interact with their social network using their mobile phone, and which do not? What else stands out about these connected users? What is the mix of communication products and services – landline, wireless, email, IM, etc. – by segment? Are PC users primarily accessing the Internet at home, in the workplace, using friends or neighbor’s computers, or in public places such as libraries or cybercafés? Which users use other’s PCs and which have many to choose from? Are smartphones or netbooks changing this? How many display screens do people view? Which market segments view more screens than other segments? Which market segments are dating online? What else do they frequently do online? What are the attitudes about texting and driving? Who is most supportive and who is mostly opposed? Who is videoconferencing, and using which platform? How social-network active are the various tiers of gamers? Is it really one to a customer? How often are PCs shared? Which market segments use more than one PC? iPhone users – who are they really? How do they compare with Android and Blackberry users? MetaFacts, Inc. helps technology marketers find and measure their best and future customers. Current subscribers of Technology User Profile may obtain this information directly from MetaFacts, as well as additional customized drilling down into the full dataset. The above questions are answered with the TUP 2012 edition, and most are also answered in the TUP 2011 edition for ready trend comparison. Social networking is about fun and keeping connected – hardly referred to as a time-saver. Our latest research confirms that adults busiest with their PCs use social networking the most. Three out of four (77%) of adults who spend 80 or more per week with their PC use a social network, versus only 45% of those who use their PCs less than five hours per week. It’s not as if Cityville is capturing all the hours among those busiest. Game-playing is ranked 7th across all usage levels save one. There is no single type of activity that the least-busy do that the most-busy don’t. It’s more that the least-busy simply scratch the surface of social networking activities while the busy, well, get busy. The rank order of social networking activities is not significantly different between the least-busy and busiest. Simply put, the busiest computer users use the widest range of social networking activities. So, what’s the attraction for these busiest PC users that hasn’t lured the less-busy? Four activities stand out to separate the busiest from the least-busy. One is rather passive, one bodes well for social media marketing, and the other two show a heightened level of user involvement and concern. Watching a video, such as following a link to YouTube or Video, is done by the busiest at nearly triple the rate of the least-busy. Similarly, 31% of social networkers who use their PCs for 80 or more hours per month say they have recently clicked a social network ad, triple the 10% rate among those using their PCs for less than five hours a week. Removing content, such as deleting photos or posts, and adjusting privacy settings, is done by the most-active PC users at triple the rate of the least-busy. These two activities are related, as social networkers seek to control their public footprint. Social networking relies on a delicate alchemy of trust, encouraging user-generated content and attracting participation by preserving privacy, and helping networkers feel they are discovering things rather than being sold to. In our Technology User Profile survey, we also asked those who don’t use a social network why they disconnected. Of those who use their primary PCs 80 or more hours per week, 26% said they stopped using a social network because they were wasting their time. From the least-busy to the busiest, agreement was the same, ranging between 20% and 28% of online adults. Looking ahead, the near-term future for social networks will still include turmoil. There are a substantial number of online adults who aren’t finding a compelling reason to spend as much of their time networking online. Furthermore, trust issues continue, with 19% to 28% of the unnetworked having stopped citing privacy concerns. Still, it’s a bullish sign that the top activities for the busiest users are to expand their network and add content. To the extent the social network can continue to bring value and interest to the busiest users, this may encourage more use among current users, and possibly open the door for the return of former social networkers. The information in this MetaFacts TUPdate is based on the Technology User Profile service. 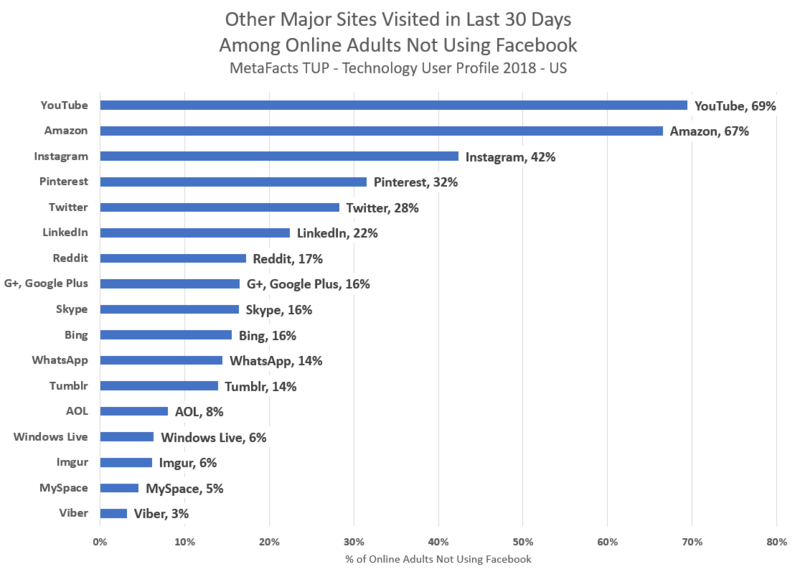 For this TUPdate, MetaFacts reviewed its surveys of online adults and how they use their primary PC. This is the PC they use the most often, whether it is owned by them, their employer, a friend, or in a public place. To see other research coverage of Internet products and activities – from smartphones to feature phones, desktops to notebooks, social networking, demographics, and attitudes – see the many other questions TUP answers on www.technologyuser.com. Tech market research professionals can license direct access to TUP. Direct marketers may be interested in certain specific Consumer Tech Index issues: Top Home PC Socializers, Top Home PC Communicators, and Top Home PC Funlovers. These identify what makes these active consumers different from the general market, in an actionable and useful way. Strategic planners and marketers can contact MetaFacts to access the Technology User Profile Overview Report, which covers the broader range of key trends. View findings in 25 pages of executive summary analysis, 200+ pages of charts and graphs, all supported by 95+ pages of detailed tables. The complete, 300+ page report is delivered to you electronically. MetaFacts releases ongoing syndicated original research on the market shifts, trends and consumer profiles for Smartphones, Netbooks, Mobile PCs, Workplace PCs, Home PCs, Web Creators, Broadband, and many other technology products and services. These TUPdates are short analytical articles in a series of specific topics utilizing the Technology User Profile Annual Edition study, which reveals the changing patterns of technology adoption around the world. Interested technology professionals can sign up at http://technologyuser.com/contact/ for complimentary TUPdates – periodic snapshots of technology markets. MetaFacts helps technology marketers find and measure their best and future customers. 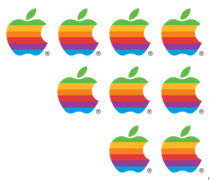 MetaFacts’ Technology User Profile (TUP) survey is the longest-running, large-scale comprehensive study of its kind, conducted continuously since 1983, the year before Apple released the Apple Macintosh. The detailed results are a primary market sizing and segmentation resource for leading companies providing consumer-oriented technology products and services, such as PCs, printers, Smartphones, consumer electronics, mobile computing, and related services and products. TUP analyzes key trends and the data-rich source can be dived into more deeply for custom analysis. For more information about the syndicated research service, analysis tools, publications and datasets, contact MetaFacts at 1-760-635-4300. Fun is one of the strongest gravitational forces drawing people to use the Internet. There are of course many other factors influencing usage and adoption levels, such as productivity and connection with friends, yet fun and enjoyment are key human needs. 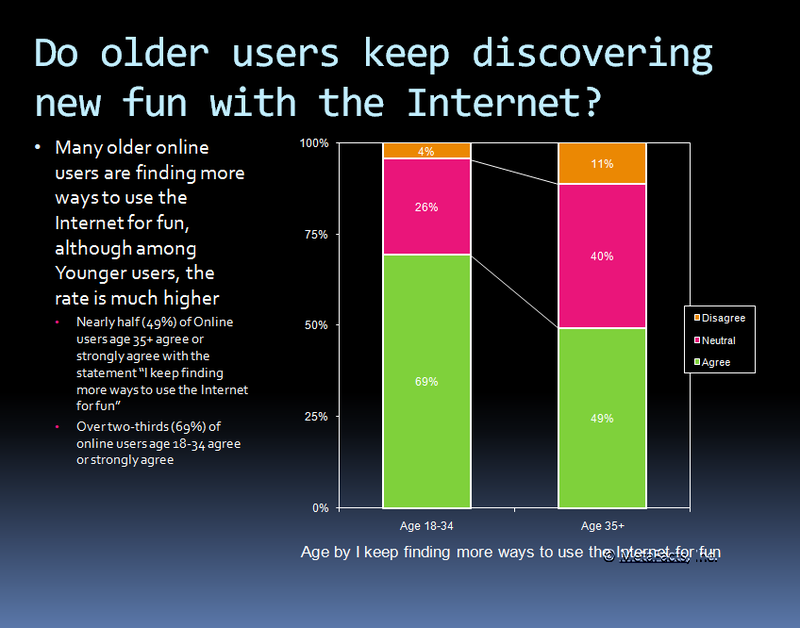 As part of Technology User Profile, we asked respondents whether they are finding more ways to use the Internet for fun. Nearly two-thirds (64%) agreed or strongly agreed. This is from a carefully balanced sample of 8,175 adults in the second phase of the Technology User Profile survey. Even at surface level, this finding is a positive sign for the continued growth and strength of the Internet and the many technology products and services relying on it. As adults continue to explore new ways to use the Internet it is a positive sign, and it’s even better to see that the majority of adults do so. Not all adults agree, however, and some groups show more enthusiasm than others. Younger adults (age 18-34) more strongly agree that they are finding more fun online, with nearly 7 in 10 (69%) agreeing or strongly agreeing. Fewer older adults (age 35 and up) are as enthusiastic, with just under half (49%) agreeing or strongly agreeing. We also looked more closely to compare Smartphone subscribers to users of Basic Mobile Phones. We wanted to see whether Smartphone users are so charmed with their newer technology that they aren’t enjoying their Internet experience as much for fun. Smartphone subscribers actually have a higher enthusiasm for the web than users of Basic Mobile Phones. Over two-thirds (70%) of Smartphone users agree or strongly agreed with the statement “I keep finding more ways to use the Internet for fun.” This is stronger than the 54% of Basic Mobile Phone users who similarly agree. This is due only in part to the generally younger age of Smartphone subscribers, because other factors also define the difference: marital status, presence of children (particularly teens), and gender. Looking more deeply, we examined whether technology experience made a difference. Correcting for age, long-time PC users had the same attitude as those newer to using a PC. There was no significant difference between the attitudes of younger adults (age 18-34) who are Younger PC Newbies – who have used a PC for less than a quarter of their lifetime and Younger PC Veterans, those who have more experience. Also, within older adults (age 35+) the attitudes are the same for Older PC Newbies and Older PC Veterans. In related analysis, lack of interest is a key deterrent to many that are not using social networking sites such as Facebook, LinkedIn, or MySpace. The technology industry thrives on change and exploration, and while there have been cycles of irrational exuberance and retrenchment, true and sustainable growth or contraction is based on the attitudes and behaviors of technology consumers. Fun and home entertainment is one key component of the most enthusiastic tech consumers, and for these fans, the Internet is a strong part of their home entertainment experience. With Smartphones and Tablets vying for tech consumers’ attention, PCs stand to be threatened as user’s core Internet portal. Furthermore, different groups of tech consumers react differently to key damping issues such as over-advertising, spam, and privacy concerns. Fortunately for the tech industry, the quest for fun continues to be a major and positive part of the leading indicators defining technology adoption. MetaFacts Technology User Profile Overview Edition – report available by contacting MetaFacts. View findings in 25 pages of executive summary analysis, 200+ pages of charts and graphs, all supported by 95+ pages of detailed tables. The complete, 300+ page report is delivered to you electronically. This edition is for the U.S. based on the 2010 wave of Technology User Profile gathered among a scrupulously selected set of representative respondents, surveyed both online and offline. To see other research coverage of Internet products and activities – from smartphones to feature phones, desktops to notebooks, social networking, demographics, and attitudes – see the many other Internet-oriented questions TUP covers on www.technologyuser.com. MetaFacts, Inc. is a market research firm focusing exclusively on the technology industries. MetaFacts’ Technology User Profile (TUP) survey is the longest-running, large-scale comprehensive study of its kind, conducted continuously since 1983, the year before Apple released the Apple Macintosh. The detailed results are a primary market sizing and segmentation resource for leading companies providing consumer-oriented technology products and services, such as PCs, printers, software applications, peripherals, consumer electronics, mobile computing, and related services and products. TUP analyzes key trends and the data-rich source can be dived into more deeply for custom analysis. For more information about the syndicated research service, analysis tools, publications and datasets, contact MetaFacts or call at 1-760-635-4300.